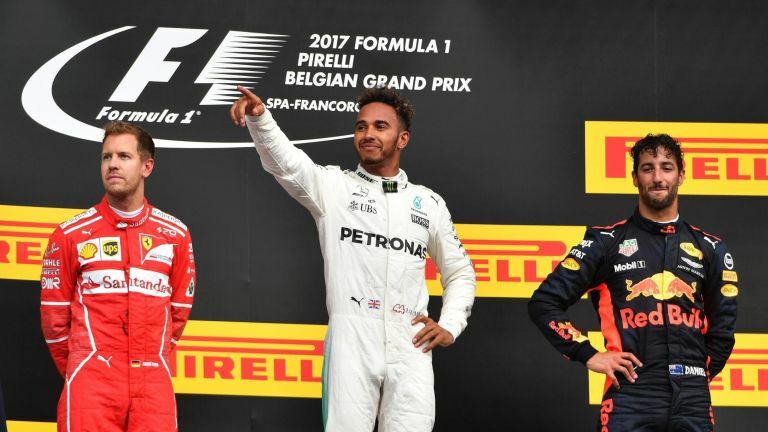 The Belgian Grand Prix presents an incredible opportunity for British driver Lewis Hamilton to extend the gap at the top of the 2018 F1 Drivers' Championship. He's the man of the moment, coming off the back of two wins in the last two races, and with our help you can easily watch the latest Formula 1 race for free – no matter when on Earth you are. Hamilton carried some serious momentum into the three week break, with wins in Germany and Hungary. That's given him a 24 point cushion over fierce rival Sebastian Vettel. And the form books are on Hamilton's side, too – he's won at the historic Spa track in east Belgium three times before, including the 2017 Belgian Grand Prix. But the Spa-Francorchamps has a lot of long straights, which suit the ever increasing speed of the Ferraris very well indeed. Vettel will sense that this weekend is a huge chance to get back towards the top of the standings in what has become a two-horse race for the 2018 Formula 1 title. The race at starts at 2.10pm BST (3.10pm local time, 9.10am ET). But that's enough of the preamble – having landed on this page, you probably just want to know how to stream F1 live from the Belgian Grand Prix as quickly as possible. Well all you need to do is follow the below instructions – regardless of what country you live in – and away you go. This is incredibly easy to do. Open up your chosen VPN (Express VPN or one of our other recommended best VPN services) and go to 'choose location' (this may differ from VPN-to-VPN, but will be called something like 'locations' or 'servers' - it should be pretty obvious). Then select any location in the US - Express VPN alone has six UK locations, and it shouldn't matter which one you pick. UK free-to-air station Channel 4 is showing the whole Belgian Grand Prix. But after following step 2 above, your computer, phone or streaming device will now think it's in the UK. So you can live stream the F1 without paying a penny, even if you aren't physically located in the UK this weekend.